Born and raised in Little Fort, British Columbia, Jack’s world revolved around Timberview Ranch. He partnered with his father in the 1940’s to operate the family dairy farm before turning to raising beef cattle, which he did until 2014. 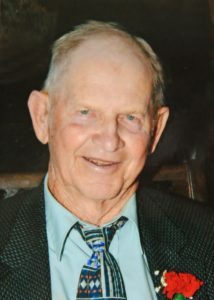 He was a Director of the BC Red Poll Cattle Breeders Association and participated in many ranch and farm associations. An active community participant, he volunteered with the Little Fort Recreation Society (originally the Little Fort Farmers Institute) for over 65 years, and during his later years became a competitive member of the Little Fort Carpet Bowlers, enjoying many regional and provincial competitions. Jack was always willing to lend a helping hand in the community, without any expectation of reward or recognition. His appreciation for wildlife and nature was instilled in each of his children. Games and sports were an integral part of his life, and carpet bowling was his love for many years. His children and grandchildren connected with him through a rousing game of cards or bocce. Predeceased by his wife, Jean Ritchie Livingstone (McDougall) in 2002. Survived by his brother, Donald Wallace Livingstone (Verna) of Chilliwack, BC, his children Sheilagh (Peter White), Bruce, Murray (Jo-Anne), Christine (Doug) Thornton and Donald (Shanna Knights), and his grandchildren Bryanna, Graham and Kendra White, Kiernan and Evan Livingstone. We will miss his laughter, the twinkle in his eye and his quiet heart of gold. Special thanks to Murray and Jo-Anne who moved back to Little Fort in 2003 to operate the farm before he was ready to retire and ensured that Dad could remain in his family home of 64 years. A heartfelt thank you to the staff at Clearwater Hospital, Royal Inland Hospital and Overlander Residential Care for their kind attention to Dad. The Jack Livingstone Memorial Games Day will be held on June 16, 2018 at his second home, the Little Fort Community Hall from 12 Noon to 4 pm. In memory of Jack, a donation to the Kidney Foundation of Canada would be appreciated. So sorry about your Dad’s passing. His quiet humour and the twinkle in his eyes will be greatly missed. He helped to raise wonderful children, each unique in their own way, and his legacy lives on through them. Looking forward to the Games day! What a great idea!